Banzai Birthday: Chocolate Banana Cupcakes! 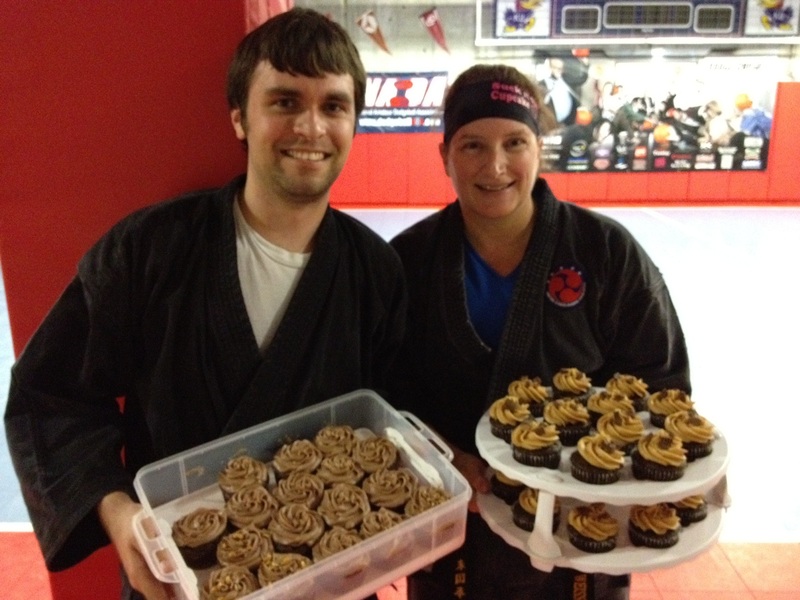 Yesterday at Colahan’s Martial Arts we celebrated two birthdays – John’s and mine. It was an extra-special celebration because Susana brought her ukulele and accompanied the infamous Colahan’s Martial Arts Choir for the birthday song. I loved it!! I baked for John and Susana baked for me, and without coordinating desserts, we both made a variation of chocolate cupcakes with peanut butter frosting. As the saying goes, Great minds think alike! We had Chocolate Banana Cupcakes with Peanut Butter Cream Frosting for John, and Chocolate Peanut Butter Cupcakes with peanut butter cups and Peanut Butter Frosting for me!! 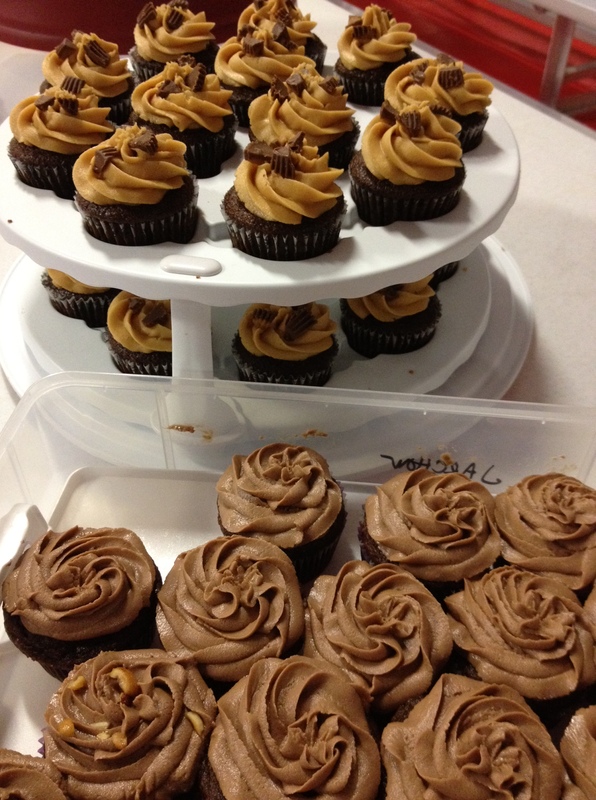 Chocolate Banana Cupcakes (front) and Chocolate PB Cupcakes! I don’t know exactly how Susana made hers, but I can give you the idea. Chocolate cupcakes had a small peanut butter cup dropped into the batter before baking. Then they were topped with peanut butter frosting and chopped peanut butter cups. Yum!! I made Chocolate Banana Cupcakes from Chocolate from The Cake Mix Doctor… I’d never made cupcakes with chocolate and banana in them, and was curious to find out how strong the banana presence would be. I used very dark bananas that I had tossed in the freezer – those that had hit the point of bad for eating but good for baking. I was pleased with the texture and the subtle banana flavor of the cupcake, and waited to choose a frosting flavor after I tasted them. Click for recipe. I considered making a marshmallow-based frosting, but opted for the lazy way because it was getting late. I wish I could tell you what I put in the frosting, but I really don’t know! I had a container of chocolate cream cheese frosting in the freezer from a recent cake, so I whipped it up with a can of cream cheese frosting and some peanut butter. 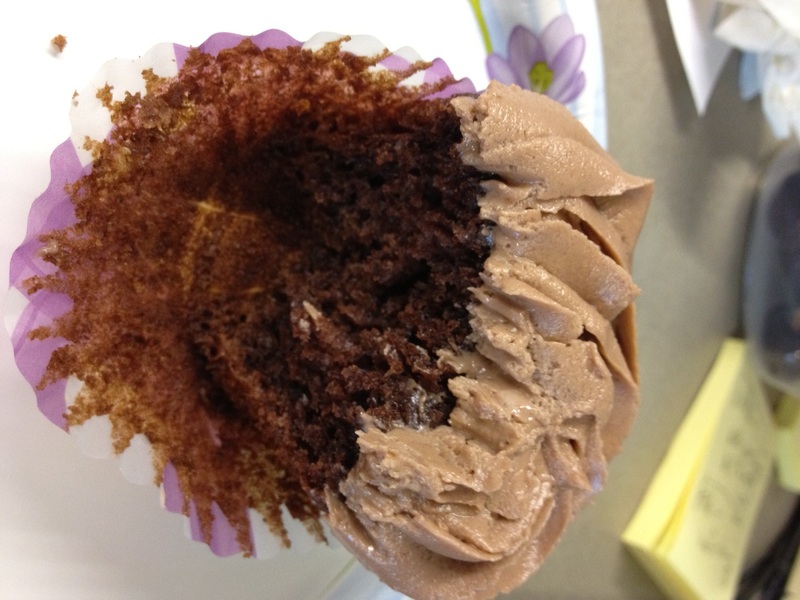 The result was a creamy chocolate peanut butter frosting that worked nicely with the cupcakes! Today, I wish I had a couple of those cupcakes. But then again, I’m really glad I worked at home today so I couldn’t get to them. The temptation would just be too much! Thank you! Your cakes are amazing. You definitely have more patience than I do! !